We haven't always been participants in our church activities. It's just one of those things we have, in the past, chosen not to take the time to do. Scott and I are so busy with work that any free time we have, we either want to play with the girls or get stuff done. All of that changed when our friends got put in as the Activity Chairs. We love them, so we support them and their activities. It also helps that they do throw a pretty awesome party. For the end of summer party, they rented the local pool and had a huge BBQ. There was so much food at this party and yet the desserts still managed to get pretty cleaned out. With some of the amazing bakers we have in our neighborhood, it's no surprise everyone saved plenty of room for desserts. 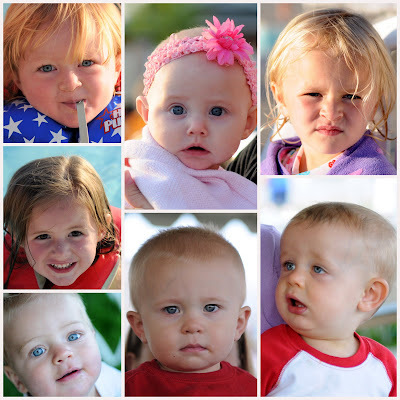 Since I ALWAYS have my camera in tow, I took some cute pictures of a few of the kids at the party. I've said this before, I think people may find me obnoxious to always have my camera in front of my face, but it's something that I love doing and to get really good at it, I need to spend as many hours as I can taking pictures. We weren't going to stay for the pool party, because I had to prepare my lesson for the next day, but the girls convinced us to stay. The diving board provided for a great deal of entertainment. 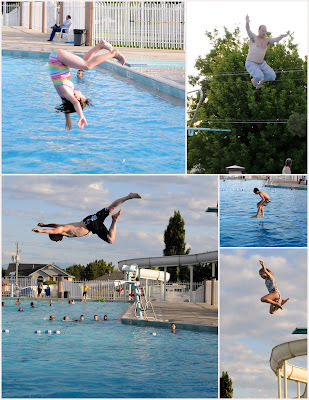 There were several kids that were absolutely fearless and jumped multiple times from the high dive. I did have a bit of a fright with Jade, the child with no fear. She asked if she could go off the high dive. I told her sure but that she needed to jump, not flip or dive. Apparently she didn't hear me. She started out with a beautiful dive and my heart began racing. I could just see her hitting the water and coming up crying because her head hurt from the impact. Instead, she decided to flip- at the last minute. (She says her body just started to rotate, but either way, it turned into a flip). Unfortunately, there just wasn't enough air left for her to finish the rotation. She landed smack on her back. So up she came, crying from the pain of the impact. The sweet daughter of the bishop dove in after her and helped her to the edge. Jade thanked her, cried for a minute longer and headed back up the high dive. 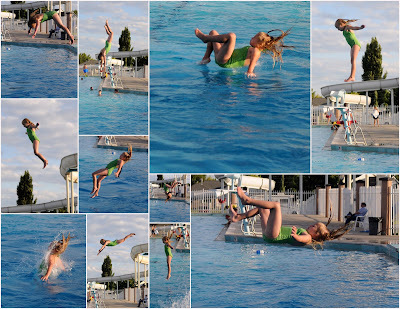 From then on, she just jumped from the high dive and flipped from the low dive. 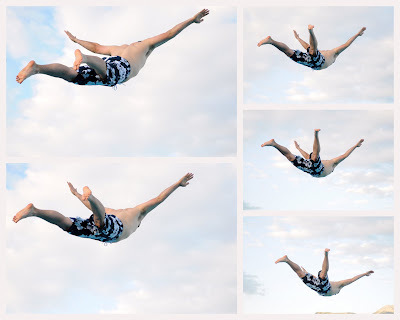 There is a picture, above, of our Bishop diving off the high dive and several pictures of some of the cute kids in the ward making their graceful entrances into the pool. Some of them "diving" feet first and others cannon balling it. But, to end the night, Tyler transformed himself into the "Flying Squirrel" and I was lucky enough to capture some of his best moments on film. It was a very fun night. Unfortunately, we won't be supporting them for the Camp Out in September because it is the same weekend as Peach Days. And you KNOW we aren't about to miss Peach Days, the parade, car show and really yummy peach cobbler. Some family traditions are just too important to miss, even for a really fun church camp out! Such fun photos. Keep clicking-- it's only supposed to take 10,000 hours to become an expert at anything! We were at Maddox 2 weekends ago when they just started making peach pie. We were too late, though, and they ran out! 10,000 hours or supposedly you can read three books to become an expert on anything! love the pics as always.